Jill Bell, Brown & Co, Brigg, May 2018. Helen Portess, Brigg, May 2018. “Very professional and he has done an amazing job, proper carpet cleaning equipment, not those small carpet cleaners that some use. All my stains were removed and my carpet is beautifully clean and smells lovely too. Highly recommended” Heidi Burkill, Winteringham, February 2018. “Andy turned up as he said he would, and did exactly what he said he would do. There is huge assurance knowing that Andy is one of a very small band of local professional carpet cleaners actually accredited by the NCCA (National Carpet Cleaning Association). A professional job by a carpet professional. You get exactly what you pay for – and Andy is worth every penny”. John McHale, Scawby, May 2017. Pile Up / Andy Lindsley every time”. Roy Shipp, Winteringham, May 2017. “Andy Cleans our carpets at our school and does a fantastic job works very hard and gets our repeated business”. Martin Riggal, Brigg, April 2017. “A very professional yet friendly and personal service from Andy, coupled with expert advice. From coming out to quote to cleaning and coating our quarry tiles, Andy did a terrific job – going the extra mile to ensure we got the result we wanted”. Mr & Mrs Potter, Spridlington, April 2017. “Andy at Pile Up Cleaning Ltd cannot be faulted, Andy provides you with a lot of knowledge and advice before recommending the best treatment for your home/business. Myself and my family have used Pile Up Cleaning Ltd a number of times at various places and Andy has shown amazing results each time. The quality and service given will always be a selling point for me, can’t recommend Pile Up Cleaning Ltd enough. Above and beyond! 5*”. Philippa Buss, Keelby, April 2017. “We had 3 carpets cleaned this week, excellent service and a fantastic result. I would recommend you to everyone. Thank you x”. Elisabeth Welsh, Barrow-Upon-Humber, March 2017. “As a retired Quality Manager I can heartily recommend Andy’s services. I had used someone else in the past – The difference was like chalk and Cheese! Keep up the good work Andy and I wish you many customers – they will not be disappointed!”. Richard Fretwell, Scunthorpe, February 2017. 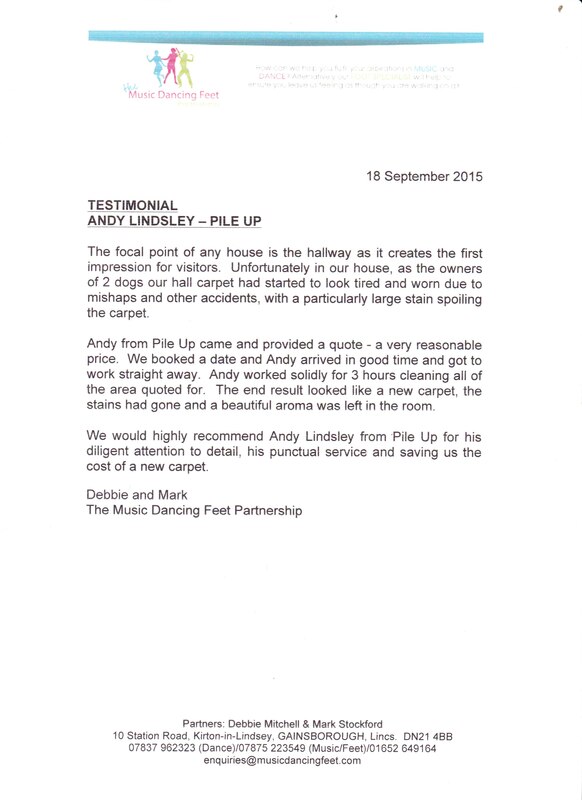 “I would like to thank Andy of Pile Up Cleaning for the outstanding professional care he gave us in caring for our lounge. We were going to exchange the carpet for a new one due to the coal fire in the room leaving soot deposits and dark areas where coal had fallen onto the carpet. Andy arrived promptly and provided a quote which was very thorough and he even deducted areas which didn’t require cleaning such as where the hearth protruded. Andy managed to move furniture out of the way and was very good with pets, even when our puppy started to chew his dongle he remained calm and composed. Excellent service, excellent value and highly recommended” – Maureen Lea, Cleethorpes, August 2016 . “On behalf of Laura and Steven….Huge Thank You. Absolutely delighted with the fantastic job you have done. Living room, hall and 3 bedrooms, all back to their beautiful spotless white condition. And Laura loves that the pile is back to fluffy…you can see footprints in the pile just how it was when they were first laid. Even more impressed that not 1 stain is left…not even the tumeric tinted lime pickle! Fantastic job Andy Lindsley. Thank you!! !” – Jeanette Dean, on behalf of son and daughter in law, Steven and Laura, Scotter, July 2016. “Absolutely fantastic service today from a lovely gentleman who really knows his stuff. Time was no rush and every effort was made to ensure the job was done to the highest standard. Thanks again and highly recommended” – Karla Harvey, Barrow-Upon-Humber, July 2016. “The service from Andy (Pile-Up) was absolutely amazing from the speedy response to my first enquiry to the fantastic job cleaning my carpets. My carpets looked like new when finished and smelled lovely and clean. Can not thank you enough for an amazing job. I will recommend pile-up to all my family and friends and will definitely be using you again. Thanks again Andy you’re a star.” – Liz Gill, Barton Upon Humber, June 2016. ” Just wanted to say a big thank you for doing a great job on Monday on our carpet and sofas. They really look fantastic, we are so pleased ! Will definitely recommend you and use your company in the future” – Vanda Harrison, North Kelsey, December 2015.